If it's Friday, it must be Offal of the Week! Brought to you by Ryan Adams, author of the blog Nose to Tail at Home, each week we highlight a different part of the animal that you've always wanted to work with, but were afraid to ask your butcher for. This week: Some offal-driven Thanksgiving recipes. Last week we looked at a few ideas of what to do with the bag of turkey giblets and neck that you've most likely neglected year after year. This week, some more offal-driven Thanksgiving recipes! 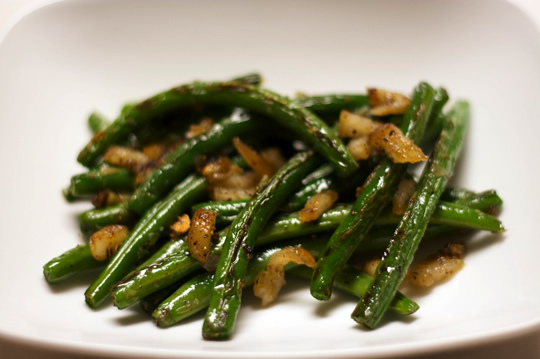 First up, Haricots Verts with Fatback, a side dish that incorporates fatback in such a sneaky way that you'll be able to place it right next to the turkey and no one but you will be the wiser. For the day after (or whenever you wake up from your tryptophan coma), Dirty Turkey Rice is an easy, deeply flavorful way to use up the contents of the giblet baggie and some of the leftover turkey meat. Bring a pot of salted water to a rolling boil. Meanwhile, prepare an ice bath (equal parts cold water and ice cubes) in a large mixing bowl. When the water has come to a boil, blanch the haricots verts for 2-3 minutes. Quickly remove them from the water and plunge them into the ice bath. (This stops the cooking and preserves the beans' color and texture.) Once the beans have cooled (about 30 seconds to 1 minute), remove them from the ice bath and pat dry on paper towels. In a small pan over medium heat, render one of the strips of fatback over medium heat until there is a thin layer of fat coating the bottom of the pan. Reduce the heat to medium-low and sweat the garlic and shallots until they are soft and translucent - don't let them brown! Remove the pan from the heat and transfer the beans to a serving dish, reserving the strips of fatback. Finely chop the fatback, and then sprinkle it over the haricots verts. Grate or sprinkle the nutmeg over the dish and serve immediately. Turkey giblets (i.e. the organs in the baggie inside the turkey) plus the meat from the turkey neck, all roughly ground or coarsely chopped. When the meat is fully browned (but not necessarily cooked through), add the remaining tablespoon of bacon grease or oil to the pot. Add the onions, bell peppers, celery, garlic, and spices and cook, stirring, until the vegetables are softened. Add the turkey stock and bay leaves, and scrape the bottom of the pan to free any browned bits. Bring everything to a rolling boil, then lower the heat and simmer for about 5 minutes until the liquid reduces by a third. Add the pre-cooked rice and incorporate thoroughly. If you're using leftover cooked turkey meat, add it now. Cook until the rice is heated thoroughly. To serve, remove the dirty rice from the heat and fish out the bay leaves. Garnish with chopped scallions.